Take A Stitch Tuesday http://pintangle.com/tast-faq/ used another new stitch for me. It was Pekinese Stitch also called Chinese Stitch. 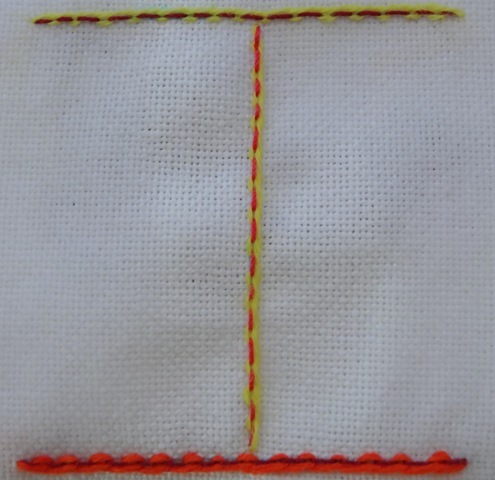 The base stitch is a Back Stitch with another thread woven through it. I used Lizbeth size 20 thread as the base and a punch yarn for the yellow. The orange is all 6 strands of embroidery thread. I liked the orange better. 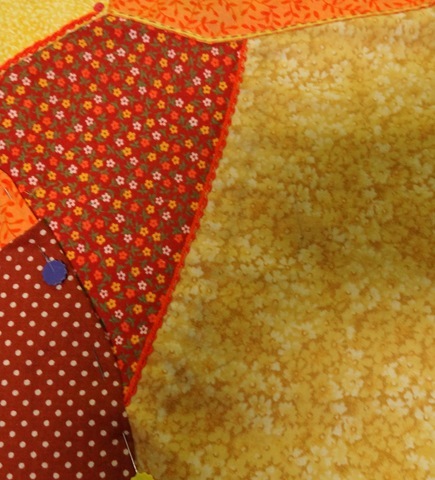 This was the 3rd week of my August Block of my Crazy Quilt Journal Project. http://www.cqjp2012.blogspot.com/ I used the same combinations of thread as on my TAST above. The pinned part on the lower left will be part of the 4th quarter of my August Block. It seems a little plain so I am thinking I may add some tatting on the right side. I will have to think about that. This entry was posted in August, CQJP, Pekinese stitch, TAST. Bookmark the permalink. I had never heard of Lizbeth thread before reading your post. I Googled it and it seems like it is used for tatting. Thanks for introducing me to it.